Numerous published studies suggest a correlation between increased consumption of fruits and vegetables and a reduced risk of developing chronic diseases, such as heart disease and cancer. 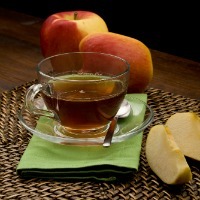 Researchers have clarified the mechanism by which polyphenols - compounds found abundantly in foods such as green tea, apples, cocoa - may provide protective benefits to health. Using cells derived from human blood vessels, Paul Kroon, the Institute of Food Research (United Kingdom), and colleagues found that low concentrations of polyphenols epigallocatechin gallate (EGCG) from green tea and procyanidins from apples block a crucial signaling function VEGF - a signaling molecule involved in atherosclerosis and in some types of cancer. The researchers note that, "These data demonstrate for the first time that VEGF is a key target for molecular polyphenols present in tea, cocoa and apples, which inhibit the signaling of VEGF and angiogenesis in physiological concentrations. These data provide a mechanism plausible that binds bioactive compounds present in food and their effects on the organism. "